140 Beacon is located on the north side of Beacon, between Berkeley and Clarendon, with 138 Beacon to the east and 142 Beacon to the west. 140 Beacon was built ca. 1860, one of a symmetrical pair (140-142 Beacon), with 142 Beacon three feet wider than 140 Beacon. As originally built, the houses had brownstone façades, a shared entrance portico, and a single cornice and mansard roof with two dormers each. They were originally numbered 120 Beacon and 121 Beacon, but re-numbered as 140 Beacon and 142 Beacon ca. 1862 when homes were built on the south side of the street. On August 6, 1859, Gardner Brewer sold the western lot, with a 23 foot frontage, to George Washington Wales, who built his home there. Gardner Brewer built 140 Beacon on the eastern lot, with a 20 foot frontage. Click here for an index to the deeds for 140 Beacon. Gardner Brewer and his wife, Mary (Weld) Brewer, lived at 23 Beacon (in 1863, when the former home of John Hancock on Beacon Hill was put up for auction, he and James Beebe bought it, razed it, and built their homes on the site; Gardner Brewer’s new home was at 30 Beacon). He built 140 Beacon as the home of his son-in-law and daughter, William and Ellen (Brewer) Amory, who were married in February of 1860. On December 15, 1863, Gardner Brewer transferred 140 Beacon to Ellen Amory. William Amory was treasurer of the Langdon Manufacturing Company, owners of textile mills, and later was a wholesale dry goods merchant in his father-in-law’s firm. By 1869, the Amorys had been joined at 140 Beacon by dry goods merchant Francis Skinner and his wife, Eliza Blanchard (Gardner) Skinner, who had married in October of 1868. Eliza Skinner’s brother, Joseph Peabody Gardner, was married to William Amory’s sister, Harriet Sears (Amory) Gardner. The Skinners’ son, Francis, was born at 140 Beacon in November of 1869. By 1871, the Skinners had moved to 182 Beacon to live with her parents, John Lowell Gardner and Catharine Elizabeth (Peabody) Gardner. Ellen Amory died in January of 1873. William Amory remarried in September of 1874 to Jeanne Philomene Guichard and they moved soon thereafter to 29 Chestnut. On July 22, 1874, 140 Beacon was acquired from William Amory by Arioch Wentworth. He was a widower, and his son-in-law and daughter, British Vice-Consul Willoughby Herbert Stuart and Susan Maria (Wentworth) Erickson Stuart, lived with him. They all previously had lived at the Tremont House hotel. Arioch Wentworth was a marble dealer and major investor in real estate. When he died in 1903, he left the bulk of his estate (valued at about $7 million) to found Wentworth Institute of Technology in Boston. His daughter contested the will and, ultimately, the estate was divided between the family and Wentworth Institute. Arioch Wentworth and the Stuarts continued to live at 140 Beacon during the 1885-1886 winter season, but moved soon thereafter to 332 Beacon. 140 Beacon was not listed in the 1887 Blue Book. On August 25, 1887, 140 Beacon was acquired from Arioch Wentworth by Samuel Rowland Hart. S. Rowland Hart was a commission merchant and real estate investor who lived at 85 Dudley. He was unmarried. By the 1887-1888 winter season, 140 Beacon was the home of Miss Dora A. Collins and her sister, Helen F. Collins, who operated it as a lodging house. They previously had lived at 22 Monument in Charlestown, where they also had operated a lodging house. By 1889, among the lodgers at 140 Beacon were Henry Larned Hallett and his wife, Cora (Lovell) Hallett. The Halletts had lived at 31 Chester Square in 1888. Henry Hallett was a lawyer and served as US Commissioner in Boston. By 1890, the Halletts had moved to 121 Beacon, also a lodging house owned by S. Rowland Hart. The Misses Collins continued to operate a lodging house at 140 Beacon until 1903. S. Rowland Hart had died in March of 1891. In his will, he left the residue of his estate – including 140 Beacon – in trust for ten years, with the income from one-third to be paid to his sister, Susanna Miller Hart, one-third to the children of his brother, John Nelson Hart, and one-third to the children of his brother, Joseph S. Hart. After ten years, the principal was to be distributed to the same beneficiaries by the same proportions. Consistent with the terms of the will, on March 1, 1902, S. Rowland Hart’s estate transferred 140 Beacon to Susanna Miller Hart. On June 15, 1903, 140 Beacon was acquired from Arthur H. Russell, conservator of the property of Susanna Hart, by Mary Helena (Abbott) Sharpsteen Myer, the widow of Clark Lawrence Sharpsteen and of Isaac Myer, Jr. In April of 1903, she had acquired 142 Beacon, which she made her home with her daughter, Mary Helena Sharpsteen. 140 Beacon became the home and medical office Mary Myer’s sister, Dr. Helen Cecilia De Silver (Abbott) Michael. She and her husband, Arthur Michael, previously had lived at 35 West Cedar. On October 19, 1903, Mary Myer transferred 140 Beacon to a trust established in June of 1888, under a marriage contract between Helen Abbott and Arthur Michael. Helen (Abbott) Michael was an organic chemist who did pioneering work on the chemical composition of plants and its relationship to plant growth. Her husband, Dr. Arthur Michael, was a professor of chemistry at Tufts and, later, at Harvard. In 1903, Helen Abbott received her M. D. degree from Tufts and opened a hospital for the poor, probably located at 140 Beacon. In the 1904 City Directory, she is shown as living and maintaining her offices at 140 Beacon. Her husband is listed at 27 Brimmer. Helen Michael died in November of 1904, the victim of influenza contracted from one of her patients. On March 6, 1905, Helen (Abbott) Michael’s trust transferred 140 Beacon back to Mary Myer. On January 20, 1906, Mary Myer transferred 140 Beacon to James Wright as a trustee. That same month, her daughter and the Van Norden Trust Company transferred 142 Beacon to James Wright as trustee (Mary Myer had transferred 142 Beacon the Mary Helena Sharpsteen in December of 1903 who then transferred it to the Van Norden Trust Company as a trustee on her behalf; in October of 1905 she had married to actor Errol Dunbar). On February 21, 1906, James Wright transferred the two properties to William J. Henderson as successor trustee. For the next thirty years, 140 Beacon and 142 Beacon were held by trustees of trusts established by Mary (Abbott) Sharpsteen Myer and Mary Helena (Sharpsteen) Dunbar: William Henderson from 1906 to 1909, Richard Hunter from 1909 to 1916, and the Equitable Trust Company of New York from 1917 to 1935. Mary Myer and her daughter and son-in-law lived in New York City and both 140 Beacon and 142 Beacon were leased to others. Between 1907 and about 1915, 140 Beacon was occupied by several single men, either as a shared home or as a lodging house. • Lawyer Bradley Webster Palmer, who lived at 140 Beacon until 1910, when he moved to 318 Beacon). Among other residents of 140 Beacon during this period was Nelson Slater Bartlett, Jr., a stockbroker, who lived there in 1912 and 1913. He previously had lived in Natick and, before that, at 272 Marlborough with his widowed father, Nelson, Sr. He also maintained a residence in Manchester (probably with his father). He married in May of 1913 to Christiana Sargent Hunnewell and they moved to 311 Marlborough. Also among the residents of 140 Beacon was Arthur Adams, a banker and trust company officer, who lived there from about 1912. He previously had lived at 177 Commonwealth with his mother, Fanny Cadwallader (Crowninshield) Adams, the widow of John Quincy Adams. 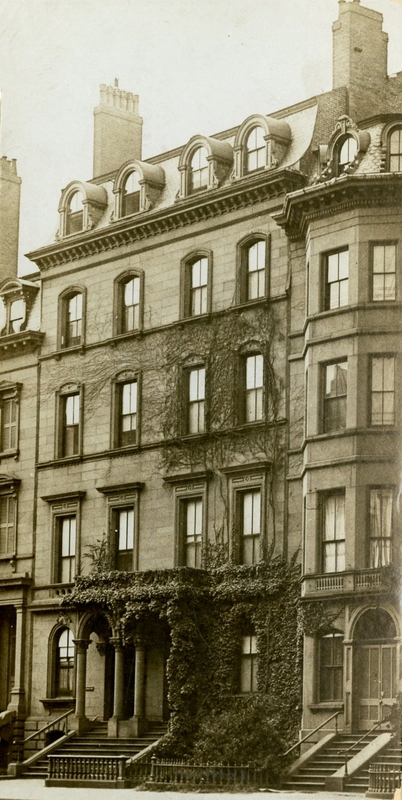 He continued to live at 140 Beacon until 1915, when he joined Louis A. Frothingham in moving to 33 Brimmer to live with attorney Roland Gray and his wife, Mary (Tudor) Gray. 140 Beacon was not listed in the 1916 Blue Book. By the 1916-1917 winter season, 140 Beacon was the home of attorney Odin Barnes Roberts and his wife, Ada (Mead) Roberts. They previously had lived in Brookline. They continued to live at 140 Beacon during the next season, but had moved thereafter to 32 Lime. 140 Beacon was not listed in the 1919 Blue Book. During the 1919-1920 winter season, 140 Beacon was the home of Francis Hurtubis, Jr., a lawyer specializing in automobile law, and his wife, Anna Florence (Toole) Hurtubis, and their daughters, Rosalind (Anna Rosalind) M. Hurtubis and Virginia Hurtubis. In 1918, they lived in Swampscott. Also living at 140 Beacon in January of 1920, at the time of the US Census, was Maria Theresa (Hartnell) Blake, the wife of William Horton Blake, and their two children, Thomas Dawes Blake 2nd and Susan Blake. William Blake was an advertising agent in Chicago, where he was living in 1920 while his wife and children were in Boston; the Blakes divorced the next year. Mrs. Blake probably was in Boston in anticipation of Thomas Dawes Blake entering Harvard in 1921 with the class of 1925. By the 1920-1921 winter season, Thomas Dawes Blake was living at 286 Beacon, and Maria Teresa Blake and Susan Blake were living elsewhere (probably in Chicago). By the 1920-1921 winter season, 140 Beacon had become the home of Mrs. Harriet (Bradstreet) Frost Lane, the widow of Joseph Frost and of Charles L. Lane, and her daughter, Cornelia Frost. They previously had lived at 10 Arlington. 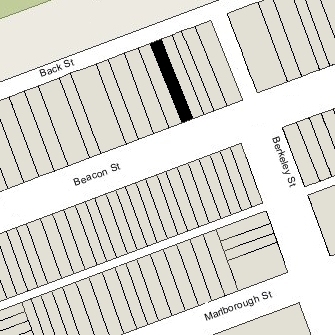 It is quite likely that they operated a lodging house 140 Beacon, as they had at 10 Arlington. Harriet Lane died in June of 1922, and by 1923 Cornelia Frost had moved to 16 Marlborough. By 1923, 140 and 142 Beacon were being operated as a single lodging house. On April 7, 1936, 140 Beacon was acquired by Della Saul (Salinsky), the former wife of George Lapidus. She lived at 302 Beacon with her son, Robert Jason (Lapidus) Saul, and her unmarried brother, Allen Payson Saul (Abraham Salinsky). Allen Saul was a chiropodist and operated the Allen Payson Company, dealers in elastic stockings. Della Saul also was a chiropodist and operated Caporn Correct Corsetry conjunction with her brother’s elastic stockings business. In May of 1936, Allen Saul applied for (and subsequently received) permission to convert 140 Beacon into seven apartments, including replacing the front façade. The remodeling was designed by architects George Nelson Jacobs and William Nelson Jacobs. Architectural plans for the remodeling — including elevations, floor plans, and elevator and fire escape plans — are included in the City of Boston Blueprints Collection in the Boston Public Library’s Arts Department (reference BIN P-137). In January of 1943, Della Saul purchased 35 Marlborough, and she, her son, and her brother moved there, operating it as a lodging house. Della Saul married again in 1944, to leather manufacturer Jacob Newman. After their marriage, they lived at 14 Buswell Street. Robert Saul lived with them. On August 7, 1944, Allen Saul acquired both 140 Beacon and 35 Marlborough from his sister. He continued to live at 35 Marlborough. Jacob Newman and Della (Saul) Newman separated in about 1951 and, by 1952, she and her son had moved to an apartment at 219 Beacon, a building which Allen Saul had purchased and converted into apartments. In about 1953, Della Saul moved from 219 Beacon to an apartment 140 Beacon. At about the same time, Allen Saul also moved there from 35 Marlborough. Della Saul continued to live at 140 Beacon until about 1971. Allen Saul continued to live there in 1981, and possibly until his death in July of 1988. On November 8, 1989, 140 Marlborough was purchased from the estate of Allen Saul by Paul G. Roiff, trustee of the 140 Beacon Realty Trust. The property subsequently changed hands and, on December 16, 1993, was purchased by Solomon Boucai, trustee of the Beacon 140 Nominee Trust. In January of 1996, he applied for (and subsequently received) permission to increase the number of apartments from seven to eight. On December 3, 2015, Solomon Boucai transferred 140 Beacon to the Boucai Properties LLC and to the Beacon Street Family Trust LLC (Lewis A Sassoon, manager), each with a 50 percent interest. 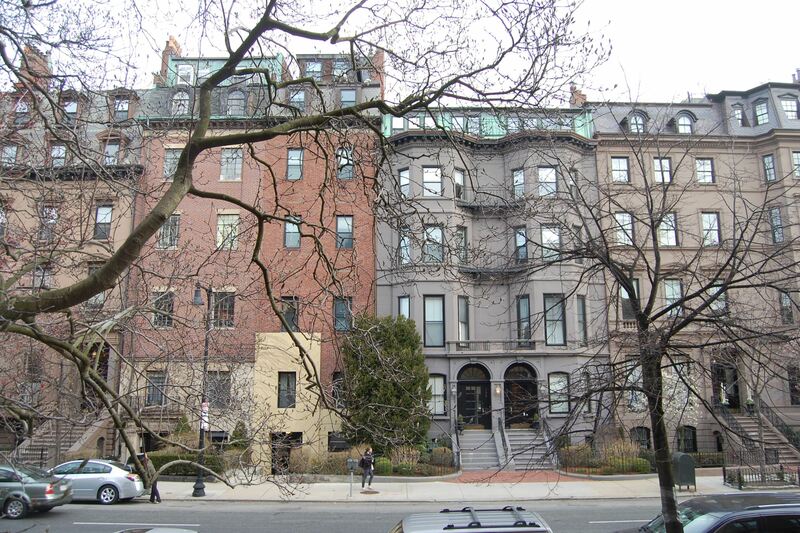 On the same day, the 142 Beacon Trust LLC transferred 142 Beacon to the Boucai Properties LLC and to the Beacon Street Family Trust LLC, each with a 50 percent interest. Also on the same day, the two LLCs entered into an agreement giving each other the right of first refusal if either wished to sell either property. On April 1, 2016, the Beacon Street Family Trust LLC acquired Boucai Properties LLC’s interest in 140 Beacon. On March 30, 2016, Boucai Properties LLC had acquired the Beacon Street Family’s Trust LLC’s interest in 142 Beacon. 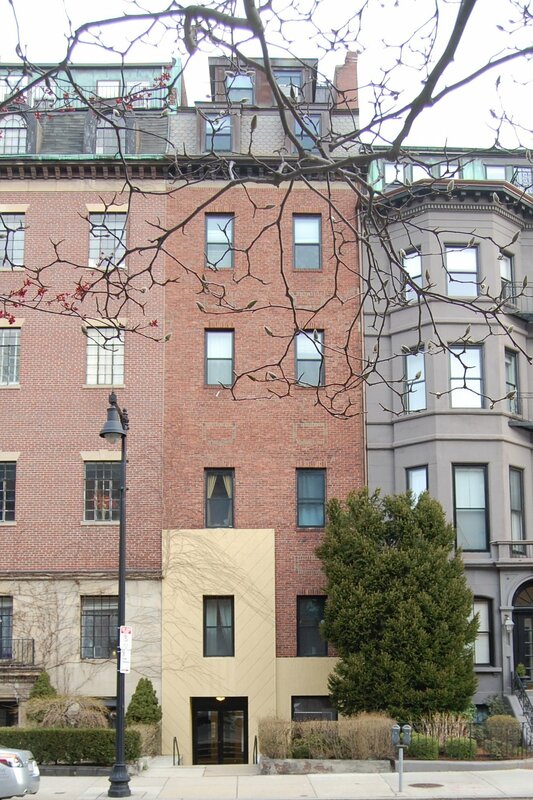 140 Beacon remained an apartment building, owned by the Beacon Street Family Trust LLC, in 2016.